Sit back and relax as you travel into the amazing Blue Mountains. Your Driver Guide will provide details of the day’s itinerary while you enjoy the journey west. At Scenic World enjoy 360° views of the Jamison Valley. To ride on the famous Scenic Railway, Cableway and Skyway, why not purchase the Unlimited Discovery Pass. Alternatively, embark on a scenic walk for spectacular views over the Jamison Valley, or relax over a coffee in the café. Entering the National Park and winding your way along Cliff Drive, you’ll take in spectacular views of Megalong Valley before arriving at Echo Point. 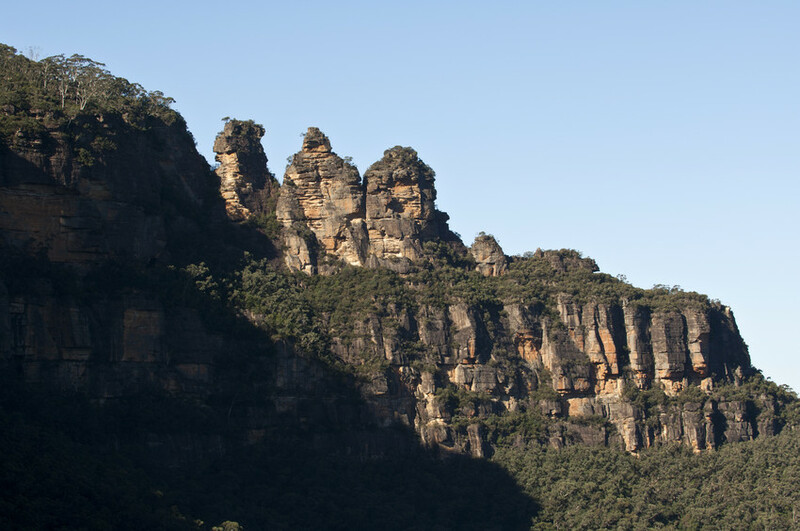 Echo Point has views stretching across to the Three Sisters – a trio of rocky pinnacles. Learn about the Aboriginal dreamtime legend of the Three Sisters. Next is a stop at the picturesque and quaint town of Leura. Here you can grab a bite to eat at one of the many restaurants and cafés or why not choose our optional lunch. This beautiful town will take you back in time and is famous for its antique stores and of course its Candy Store which is stocked floor to ceiling with more than 1,000 unusual sweets gathered from all over the world. Stop at Featherdale Wildlife Park. Situated on seven acres of natural bush setting, you’ll be able to hand-feed kangaroos, wallabies and emus and enjoy a face-to-face encounter with one of the friendly koalas. You have the option to escape the city traffic on your return to the city. Board your cruise and relax as you make your way down the Parramatta River, admiring waterside suburbs and scenery along the way, passing under the Sydney Harbour Bridge before arriving at Circular Quay or Darling Harbour. We pick up from selected hotels. If you can't find your hotel listed in the pick up, we will pick you up from a convenient pickup point close by. Group Tour: Please book direct. Please check 'Specials' and receive discounts. A group of 12 or more people are picked up from any Sydney Metro area for a private tour.